I’m very excited to announce that NIMBIoS, the National Institute for Mathematical and Biological Synthesis, will be hosting a workshop, “Evolutionary approaches to the understanding of decentralized warfare,” September 16-18, 2015, at the University of Tennessee, Knoxville. I am organizing this workshop along with Luke Glowacki (Harvard University), Anna Simons (Naval Postgraduate School) and Sergey Gavrilets (University of Tennessee). Objectives: Warfare is a widespread and arguably universal practice of human societies. While war’s origins continue to be debated, warfare has occurred in most historically documented societies, from hunter-gatherers to nation-states. Its prehistoric traces can be found in fortifications, weapons, mass graves, and skeletal trauma. 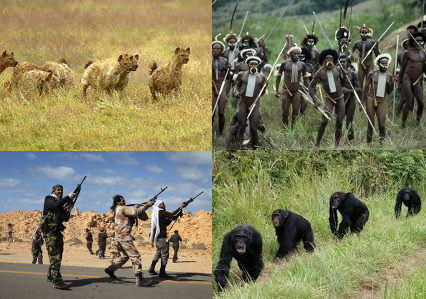 Given that it is a major source of mortality, warfare has potentially acted as a powerful source of selection for both biological and cultural evolution. In a reprise of the past – and in contrast to force-on-force, hierarchically organized wars among great powers – conflict today takes a number of decentralized forms, from urban gang fights to livestock raids, and from clan warfare to leaderless resistance and terrorism. Suggestive parallels exist between current patterns of warfare and those that typified subsistence-level societies. Consequently, examining psychological mechanisms that evolved under ancestral warfare conditions may shed important light on what motivates individuals during modern decentralized wars and why people resort to violence in intergroup conflicts. Given the availability of data from contemporary societies and the great damage caused by violent conflict, advancing our understanding of such conflict is both tractable and important. In this workshop, we will begin working toward an integrated approach to the study of warfare under decentralized or only loosely controlled conditions, combining empirical data, evolutionary theory, and mathematical models. We envision developing working hypotheses to answer several key questions about between-group conflict in general, and the nature of ‘decentralized warfare’ in particular. These hypotheses will be informed by evolutionary theory using data from diverse conflict settings. Our hypotheses will be articulated in a framework amenable to formal modeling that will point the way toward a multi-level predictive understanding of warfare. Application deadline: May 17, 2015. To apply CLICK HERE. Participation in the workshop is by application only. Individuals with a strong interest in the topic are encouraged to apply, and successful applicants will be notified within two weeks of the application deadline. If needed, financial support for travel, meals, and lodging is available for workshop attendees.